A term usually associated with monetary choices leading to profit, it is important to acknowledge that none of my investments would have worked if money was my paramount objective. My main investments have been using my time to bring my energy, skills and spirit to different people and projects. I did that for a variety of reasons; sometimes to learn more, to prove what I could do and test myself, sometimes just because I really liked the cut of somebody's jib. More often than not it was all of these reasons and on some occasions I made money in the process. Across various time frames, it feels like those relationships have now begun to pay back in unexpected ways, such as continued support in my new ventures, new opportunities coming my way and also a broader spectrum of paid work. Invest in something you believe in to help it grow. At university my friend Rachel Taylor set up a small publication called AE (Another Escape) and I contributed to the first 3 pocket-sized issues. I thought they were so interesting and gorgeous that I basically pledged my energy to help on the project wherever it took us. 6 full-size volumes in, Another Escape is now an internationally stocked bi-annual beauty, of which I am the assistant editor. I have also invested small amounts into crowd funding campaigns, such as those by Impact Hub Birmingham, BOM and Contemporary Other, and more than the bits of cash, this response was a way of saying I believe in this, I trust you to do a great job and above all this matters to me. Taking an ongoing interest in these projects has led to different possibilities and conversations, catalysed by that first point of acknowledgement that I want to be a part of their story in some way. Show up. One thing I tend to be quite good at is showing up. Whether it's attending events or working at them, I have successfully shown my face at a lot of different creative and cultural happenings in Birmingham and beyond. The primary reason for this was because I love seeking new experiences and being surrounded by art, but a nice outcome has been meeting new people and developing a rolling understanding of current offers and the zeitgeist of the city. Commit to honing your skills and learning to understand yourself. One of the most vital investments has been maintaining the effort to attempt to draw and communicate better. This has helped me stay motivated about making and given me reason to begin to assert my place within the creative industries. Promoting yourself and being visible is important, but nothing would be a greater marketing strategy than blowing people away as your talent grows. I would urge everyone to invest deeply in their craft and pushing their work further, but also in reaching out to get better at the business side of things, and developing an understanding of how you work best and how you can nurture that. Be thankful and extend gratitude. The original assertion that my creative progression has been powered by others still very much stands, and acknowledging the beneficial role of others is an important form of re-investment that will help build long-term working relationships. Simple acts of gratitude such as recommending somebody's skills, working with them again, or giving them a thank you gift are great ways of letting people know that you value them, and that they've had a positive effect on what you're trying to achieve, personally and professionally. Find people who champion what you do. I was lucky enough to meet people who believed in me before I did; people who gave me the confidence to call myself a creative professional in the first place. Joining the Cannon Hill Collective upon graduating, I borrowed bus fare to travel to Birmingham every Tuesday night in order to work with Daniel Whitehouse and Amy Martin. It opened up my creative practice, landed me my first job in the arts, and the friends and colleagues that grew from that project remain a treasured network. In short, most of my success since can be traced back to the foundations put down in that time. Secondly, starting a blog and being an active twitter user turned me from someone afraid to show my drawings to others, to someone who really enjoys disseminating work online. Interacting with a kindred spirited audience on social media has created a culture of interest and feedback which fuels me to keep making work, and makes even my biggest ideas seem possible. 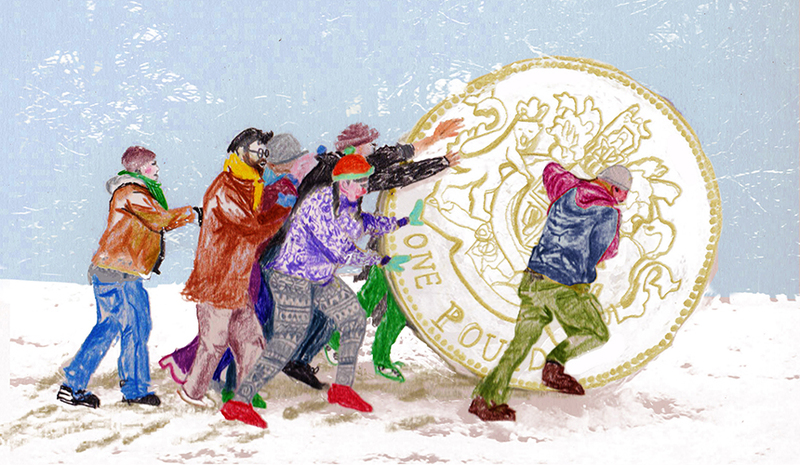 Illustration originally commissioned by IdeasTap in December 2013.